Understanding "Lord of the Flies"
Please note: Later in 2009, all GeoCities web sites will be closed. Kindly bookmark A Research Guide for Students at www.bydewey.com as the old site (started in July 1998) will no longer be accessible at www.geocities.com/researchguide. º Miscellaneous Sites Relating to Lord of the Flies, e.g. Games, Poems, Forum, Quotes, etc. Golding, William (1911-1993). Biography from Literary Encyclopedia, by William Stephenson, Chester College of Higher Education, Chester, UK. History and Background - William Golding. The Nobel Prize in Literature 1983. Press Release: "William Golding's first novel, Lord of the Flies, 1954, rapidly became a world success and has so remained." William Golding Biography, Nobel Lecture, and Other Resources. SwissEduc English Page - Golding, William: 1911-1993. Includes a portrait and signature of William Golding. Listen to Golding as he delivers his Nobel lecture in 1983. Site provides links to Golding's biography, bibliography, Lord of the Flies, 1954 - Information about the Book: Vocabulary, Word definitions, Metaphor Analysis, Allegory, Symbolism, and more. William G. Golding. Definition and Much More from Answers.com. William G. Golding from Wikipedia, the free encyclopedia. Contents: Early life, Fiction, Later life, Major works, External links. William Golding (1911-1993) - in full Sir William Gerald Golding. A short, well-written, and perceptive biography of Golding from Authors' Calendar. Excerpt: "William Golding was born in the village of St. Columb Minor in Cornwall. His father was a schoolmaster who had radical convictions in politics and a strong faith in science. Golding started writing at the age of seven ... Golding was knighted in 1988. He died in Perranarworthal on June 19, 1993." William Golding in the Yahoo! Directory. 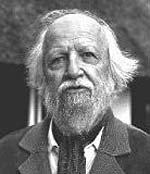 William Golding (1911-1993) - A web guide to William Golding from literaryhistory.com. The William Golding Page created by Keith Bauer. Site includes a brief biography of William Gerald Golding, his Writing Styles and Characteristics, Common Themes, Masterpieces (his published writings 1954-1993), Awards Golding has won, including the Nobel Prize for Literature in 1983, plus Responses and Quotes on Golding's books. William Golding Works - Feature Book: Lord of the Flies. Includes a biography of William Golding, William Golding: a chronological account (3 pages in PDF), Lord of the Flies ... for the student (4 pages in PDF), and Lord of the Flies ... for the teacher (6 pages in PDF). An Analysis of Lord of the Flies. Essay uploaded by regine to Slashdoc.com. Lord of the Flies - Free essays, main list. Lord of the Flies by William Golding. Adventure. World War II. From Summary Central. 16 brief paragraphs to help refresh your memory about the book: Author and His Times, Form, Structure, and Plot, Outline of Events, Point of View, Character, Setting, Themes, Style, Diction, Syntax, Imagery, Symbolism, Figurative Language, Ironic Devices, Tone, Memorable Quotes, and Additional Comments and Analysis. Pro-Banning. "There are clearly sufficient reasons to ban books, Lord of the Flies, for example, being one of those books. It was number seventy of the year’s top one hundred challenged books, and displays all sorts of violence and disturbing scenes, nonetheless being carried out by young boys." See also Anti-Banning. Teachit's Lord of the Files Resources from www.teachit.co.uk. Barr's English Class: Lord of the Flies (Handouts for Part I), Lord of the Flies (Handouts for Part II) by Bob Barsanti, High School Teacher. BookRags. Free online Book Notes on Lord of the Flies. Notes on all 12 chapters complete with mouse over explanatory notes and links to cross references. Study guide includes Author / Contest, Plot Summary, Characters, Objects, Quotes, Message Board, and Topic Tracking. Bookwolf.com: Lord of the Flies by William Golding. Wolfnote by L.F. Gulvin. Online Free Booknotes. Study guide. Contents: Context, The Author, Characters, Chapter Summaries & Interpretations for Chapters 1-12, plus Questions. Classic Note on Lord of the Flies. Contents: About William Golding, Short Summary of Lord of the Flies, Full Summary and Analysis, Character List, About the Novel, Summary and Analysis of Chapters 1-3, 4-6, 7-9, and 10-12, Links to Lord of the Flies websites, Essays (Two Faces of Man, The Relationship Between Symbolism and Theme, A Tainted View of Society, and Death and Social Collapse in Lord of the Flies), Author of ClassicNote and Bibliography, Message Board, plus a Test Yourself! 50 Question Quiz (check answers and your score at the end of the multiple choice quiz). eNotes: Lord of the Flies by William Golding. Contents: Introduction, William Golding Biography, List of Characters, Historical Background, Summary and Analysis, Character Analysis, Chapter Quizzes, Suggested Essay Topics, Sample Essay Outlines, Pictures, and Bibliography. Lord of the Flies from Answers.com. Lord of the Flies - Barron's Booknotes from PinkMonkey.com. Contents: Message Board, Download a printable copy of this booknote, Key Literary Elements (Author and His Times, The Novel - The Plot, The Characters), Other Elements (Setting, Themes, Style, Point of View, Structure), The Story - Chapter Summaries with Notes for Chaptes 1-12, Tests and Answers, Term Paper Ideas, Reference (Critics, Bibliography, Author's Other Works). Lord of the Flies - A Character Study of Ralph. Essay uploaded by lizg333 to Slashdoc.com. Lord of the Flies: Summary - Character and chapter summaries, uploaded by java to Slashdoc.com. Lord of the Flies - Free essays, main list. Lord of the Flies by William Golding from Shmoop.com. Analysis, summary, chapter-by-chapter, themes, characters, notes, study questions, literature. 'Lord of the Flies' Index. Resources for teaching 'Lord of the Flies' in English and Drama, at Key Stage 4 of the National Curriculum (United Kingdom). Contents: Themes in the novel, Symbolism in 'Lord of the Flies' (part 1), Discussion of Symbolism (part 2), Character summaries BASIC, Character information DETAILED, Characters and quotation page refs (Character Profiles), and Novel summary and chapter significance. Lord of the Flies - Lo Fat Version. Menu includes Chapter Summaries, Character Analysis, Theme/Symbolism, Important Quotes, Map of the Island, and User's Forum. Lord of the Flies - Novel Analysis from Novelguide.com. Includes Novel Summary, Character Profiles, Metaphor Analysis, Theme Analysis, Top Ten Quotes, and Biography of the author William Golding. Lord of the Flies - SparkNotes. Contents: Context, Plot Overview, Characters, Character Analysis, Chapters 1-12, Quotations, Key Facts, Study Questions, Quiz, and Suggestions for Further Reading. Symbolism in Lord of the Flies. Free essay from 123HelpMe.com. Island of Misadventure: An Internet WebQuest on Good and Evil in Literature created by Ralph A. Bucci, Charles W. Flanagan High School, Pembroke Pines, Florida. Lord of the Flies from BBC.co.uk. British GCSE (General Certificate of Secondary Education) Bitesize Revision - Revision that is easy to digest. Excellent revisions including online tests. Contents: Context - Revise including Golding - Bio & Photos, Plot - Revise + Test, Character - Revise + Test, Themes - Revise + Test, Sample Answer - Revise. "So, you know the context and you've thought carefully about the plot, characters and themes of the story - now it's time to think about how you might use all these ideas in the exam!" Lord of the Flies: Daily Activities. Original Lesson Plans in PDF, 22 pages. Very detailed daily activities for each chapter including kinesthetic drama, sandpaper art, fire laying, hut construction, face painting, shell art, parachute making, food consumption, paper bag pig making, tribal dance, reflections of then and now, use of quotations, symbols, and play dough weapons. Lord of the Flies: DVD Release - Synopsis. Directed by Peter Brook. Essays: Lord of the Flies by Peter Brook - on the filming of Lord of the Flies. Lord of the Flies Journals by Marc Zimmerman. Two main activities used to teach Lord of the Flies. Students also quizzed on individual chapters. Lord of the Flies: Law and Order. A creative lesson from Ardsley High School, Ardsley, NY. Legal Team #1, the Defense: Ralph has been accused of murdering Simon. You must draft a defense to free Ralph from punishment. Legal Team #2, the Prosecution: It's your duty to prove Ralph's guilt. Lord of the Flies - Literature Lesson Plans. Objectives of lesson plans (Grades 6-8): Students will understand 1. On a literal level, Lord of the Flies deals with what happens to a group of boys stranded on an island with no adult supervision; and 2. On a symbolic level, Lord of the Flies investigates what happens to civilized people when the structures of civilization disappear. Lord of the Flies - Web Quest from English Department, Longwood High School, Middle Island, N.Y. Contents: Introduction, Three Tasks, Process/Resource (Survival Manual, Shell Poster, Human Rights Poster), Evaluation and Conclusion. Poetry that relates to Lord of the Flies. Task: Use websites listed to find poetry that is similar in theme and symbolism of the novel. A project by unnamed educator from International College. Symbolism in Lord of the Flies. Literature, level: Middle. Posted by Maeve O'Driscoll, Ardsley High School, Ardsley, NY. Teacher CyberGuide: Lord of the Flies by William Golding from San Diego County Office of Education, prepared by Sean Wells. A supplemental unit providing resources for Grade 9 and up on: Historical background for the novel, Symbolism of the conch, Element of survival faced by the boys on the island, and Current, real-world political and social situations similar to the events in the novel. Vocabulary from Lord of the Flies by William Golding. Vocabulary of 108 words are listed in order of appearance by chaper (chapters 1-12), gathered by Jan and Carey Cook for Vocabulary University®. William Golding @ Web English Teacher. Lesson plans and resources for teaching Lord of the Flies by William Golding. Lord of the Flies - The Movie. Scenes from Peter Brook's film, 1963. Include photos of the Cast, Characters list, analysis, and/or physical description of each character, the entire story from Life magazine complete with text and photos, Actor trivia, and more. Lord of the Flies - The Movie 1963 . Director: Peter Brook. Lord of the Flies - The Movie 1963. Brief description. New York Times Review on Lord of the Flies (1963) by Bosley Crowther. Film directed by Peter Brook. Cast: James Aubrey, Tom Chapin, Hugh Edwards, Roger Elwin. Lord of the Flies - 92 minutes, UK (1963), - Film Review by Jon Fortgang, Channel 4 Film. Lord of the Flies - The Movie 1990 . Director: Harry Hook. Watch Lord of the Flies 1990 film video clip: Lord of the Flies (1990) Trailer. Lord of the Flies (1990) - Movie reviews from Rotten Tomatoes. Lord of the Flies (1990): Film Review by Roger Ebert. Cast: Ralph: Balthazar Getty, Jack: Chris Furrh, Piggy: Danuel Pipoly, Simon: Badgett Dale. Columbia Pictures Presents a Film directed and edited by Harry Hook. 90 min. Lord of the Flies (1990) Introduction Trailer. 1:15 min. Lord of the Flies (1990) - Chapter 5. 4:32 min. Lord of the Flies 1990 Video. With music only, 3:30 min. Lord of the Flies (1963). In black and white, with music only, 9:53 min. Lord of the Flies Intro Theme, Sound of the Shell, THERION-Flight of Lord of the Flies, Any Dead Bodies? all in MP3. Lord of the Flies: A Student Project from Edmonton Public Library, Canada. List of print material on Lord of the Flies found in the EPL, plus related links. What is some of the symbolism in "Lord of the Flies"? Miscellaneous Sites Relating to Lord of the Flies, e.g. Games, Poems, Forum, Quotes, etc. Book-A-Minute Classics: Lord of the Flies. Ultra-Condensed by David J. Parker and Samuel Stoddard. Lord of the Flies - Game. Know the Characters: Who Goes There? from NobelPrize.org. Lord of the Flies - How to Play. Play this game after reading the book. "The aim is to introduce some basic analytical aspects concerning the book and to challenge the reader's memory through play." The Lord of the Flies (Poem) by Erin Elizabeth Kelly-Moen. Lord of the Flies - Vocabulary Games. Matching squares of words with their meanings, Concentration, FlashCards in your choice of Java or non-Java version, and a Word Search from Quia (pronounced key-ah, short for Quintessential Instructional Archive). Mindzspeak Discussion Forum: Lord of the Flies moderated by Alicia G (Lotfanaylyzer). NovelGuide: Lord of the Flies: Top Ten Quotes. Vocabulary Classic Texts: Lord of the Flies. 108 words selected by Carey & Jan Cook from Lord of the Flies by William Golding in order of appearance by chapter. Site aims to encourage study and provide opportunity for students to learn SAT-College Prep vocabulary in context. Literature Resources @ Web English Teacher - William Golding, Lord of the Flies. Web page consists of links to Web sites relating to Lord of the Flies. William Golding - Lord of the Flies. Guided Page of Web links from English Teaching in the United Kingdom.